The Spoked Traveller | Worlds Skating in London, Ontario! Worlds Skating in London, Ontario! 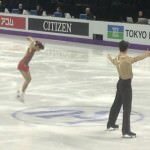 Read my blog for Tourism London about the Pairs Short program.